What is the Aon for communication. I don't know it, but there is one. The thing I do is, if somebody asks me those, I go and look at the Aons that we already have, and see if there's one that is close. If it's not named yet, and then we give it to you. So we can do that. Would you care if I took what we have on, like, Aonic, and sort of rolled it into a conlang? Yeah, that'd be fine. Aonic is the one that, like, in some ways the least useful. It has the most words that I've found for it. If you're interested in conlangs, go talk to Peter, and maybe we'll sic you on something. Maybe we can get you working on something officially. I've tried to get Peter to do something... Go talk to him. Talk nerd stuff with him. Will we ever get some sort of dictionary/guide to Aons or Forging? One that tells us how they're made, with what all the various parts of a seal mean and how we could theoretically design them? We might, but it would be a ton of work for him to put together. He compared it to when people ask if we'll ever get the full text of The Way of Kings--the in-universe book--and he said that we might, but all he has is an outline. Is there a Connection Aon? Yes, but it has only slight cosmerological ramifications. It does have them, though. Is the word Hoed based off an Aon and if so which one? Yes, it is. It would be Hoe... no Oed, O-E-D.
Is asking for an Aonic version of my name (Eugene also works) as the leatherbound Elantris personalization too much work? I wanted to check before I put the order in. If it is, I'll do something more standard. I can totally do that. EnE is an Aon. (Sarene's Aon, of wit.) You'd probably just be Evene. Would the Arelish write that like in Hangul? If so, would each Aon represent a single sound, or its full name? They would write the ENE as a single Aon, and the Ev in their equivalent of hangul, where each letter is a single sound. The Aonic Alphabet is not something I ever designed, I'm afraid. This was before I had Isaac. So, I just had a question about the name Hoid. I've gone through all these [Aons], with the "OID," I know he really cares about how it's spelled. Is there anything you can give me the "O" and the "I" and the "D"? The only ones that have the "O" and the "I" are these two right here. Am I onto anything here, or is that just a coincidence? No, those are just a coincidence. In Elantris the Aon used for healing is Aon Ien, but the definition given in the back of the book says it means "Wisdom". The other Aons have effects and definitions that go together, but "Healing" and "Wisdom" don't seem to match. Is there something there or is it an error? It's more a cultural thing. When I was naming the Aons I had some of them cross-align like this because I feel that languages, and cultures, are often messy. (Drive on a parkway, park in a driveway kind of issues.) This is the only one that ended up in the glossary that was like this, though, so I probably should have spotted that and changed it. Aons are an interesting part of this book–perhaps my favorite of the world elements. If you think about the system I've set up, you'll realize some things. First, the Aons have to be older than the Aonic language. They're based directly off of the land. So, the lines that make up the characters aren't arbitrary. Perhaps the sounds associated with them are, but the meanings–at least in part–are inherent. The scene with Raoden explaining how the Aon for "Wood" includes circles matching the forests in the land of Arelon indicates that there is a relationship between the Aons and their meanings. In addition, each Aon produces a magical effect, which would have influenced its meaning. The second interesting fact about the Aons is that only Elantrians can draw them. And Elantrians have to come from the lands near Arelon. Teoish people can be taken, but only if they're in Arelon at the time. Genetically, then, the Teos and the Arelenes must be linked–and evidence seems to indicate that the Arelenes lived in the land first, and the Teos crossed the sea to colonize their peninsula. Only Elantrians can draw Aons in the air, so someone taken by the Shaod must have developed the writing system. That is part of what makes writing a noble art in Arelon–drawing the Aons would have been associated with Elantrians. Most likely, the early Elantrians (who probably didn't even have Elantris back then) would have had to learn the Aons by trial and error, finding what each one did, and associating its meaning and sound with its effect. The language didn't develop, but was instead "discovered." There are likely Aons that haven't even been found yet. Footnote: I picture of the personalization the questioner is referring to can be found here. The question is where does the Chasm line go on new Aons? The bottom right, away from the Aon? http://brandonsanderson.com/beta/wp-content/gallery/elantris-illustrations/arelon_map_10yr_color_ebook.jpg The chasm line is under the bottom of the square, right of the center dot. On the Rao it's above the bottom circle, just to the right of the small vertical line. Ahh, ok. So would it be going down and away from the line (which is the road, right?) in a SE direction? Yes, the same angle as the chasm in the picture I linked to. Thanks Peter! Does this imply that stroke direction/order doesn't matter as long as the end result is right? Did Korean inspire the combination of glyphs to create writing for men like in Amaram's study? Yes, a little. Korean was a bigger inspiration for Aonic (in Elantris) though. 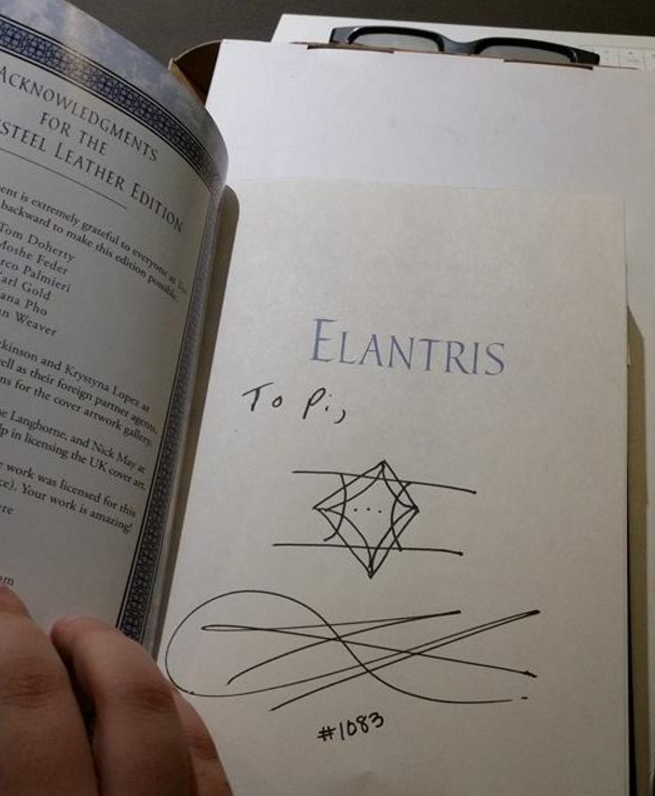 Did you have any hand making Aons for the first Elantris book, or preparing some for the second book? No, that's all Isaac Stewart. He's been working with Brandon much longer than I have, and he's responsible for all the maps and icons and symbols and most of the chapter heading illustrations, with the exception of The Rithmatist where I got to do it all. I just finished reading the 10th anniversary edition of Elantris. I'm... still a LITTLE fuzzy on how the Chasm Line looks, added to the city. Is there any chance you might post a picture of Rao with the chasm line added? I wish I could, but Elantris artwork is all Isaac's space. I haven't read the 10-year edition yet, but I was hearing it had all-new maps... they're not clearing it up? I'll have to take a look and see what you're seeing.